A couple of years ago on Toltoys.com we presented a feature on all the known Star Wars Special Offer boxed toys that had surfaced in Australia during the 1978 – 85 period. In the post below we were able to confirm that the Attack Base was a Waltons Department Store special offer and also list the contents. This week I’m happy to reveal the origins and contents of two more mysterious special offer items, the Empire Strikes Back Wampa and Tauntaun. 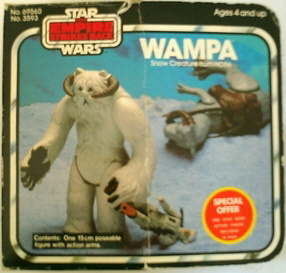 There is only one known example of the Wampa box, and only a cut front of the Tauntaun box. Neither were found with contents intact, leaving it open to speculation as to which figures were included. Now thanks to the discovery of the 1982 Waltons Wish Book we can confirm that these two were also Waltons Special Offers, and narrow down the identity of the figures included. This is the ad for both items, and while we can confirm the price and the three figures included, I’m not sure we can say which figures came with which! 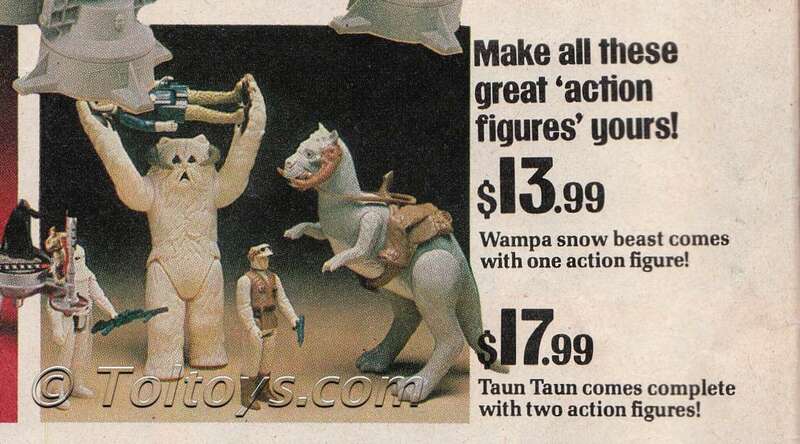 The photo suggests that Han Hoth came with the Wampa and the other two with the Tauntan, but it could just as easily have been the Snowtrooper with the Wampa (Bad guys together?) 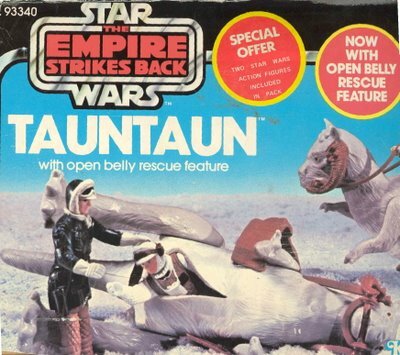 and the other two with Tauntaun. Until we find a sealed example let the speculation continue! Toltoys Star Wars Special Offer origins revealed! A couple of years ago I was lucky enough (thanks to the eagle eyes of fellow Toltoys collector Dax) to pick up a very cool Imperial Attack Base featuring a huge “Special Offer” sticker across the front, indicating that four figures were included. As featured in a previous post on Toltoys.com the origin of this piece was at first a mystery, until a Queensland collector named Paul chipped in with his recollections of seeing it at the Waltons chain of stores. His recollection was remarkably accurate, as thanks to the recently discovered 1982 Waltons Wishbook above we can confirm that the item was indeed a Walton’s Toltoys exclusive, and that the four figures included were Rebel Commander, Hoth Rebel Soldier and two regular Stormtroopers. Another part of Paul’s recollection was proved correct with the catalogue appearance of the rare Star Wars Three-Packs, priced at $6.99. What’s very interesting is that the three-packs were being sold new at retail, still in Star Wars livery, just a year before the single cards changed to Jedi packaging. Were they overstock from overseas? It’s hard to believe that they weren’t a popular item wherever they were sold. 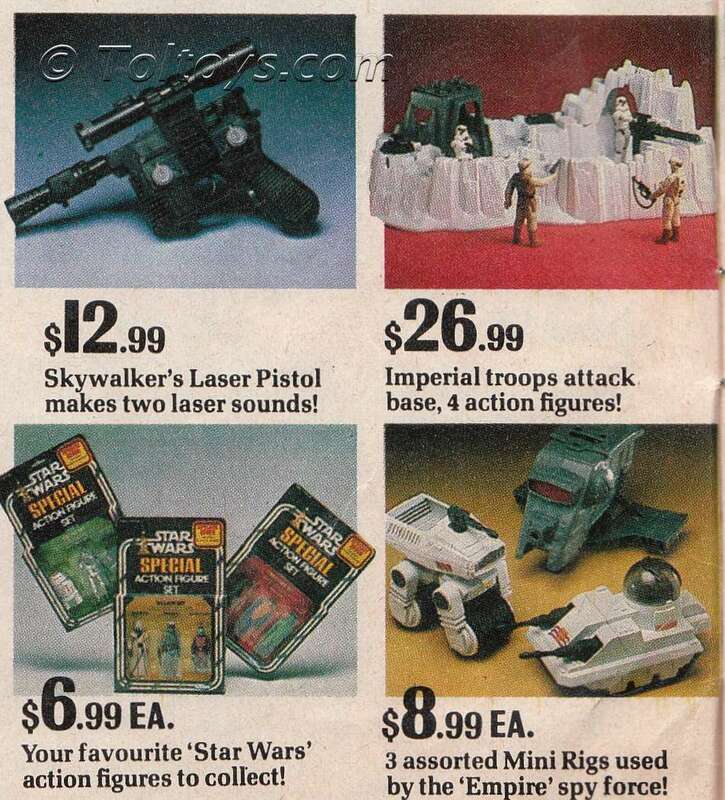 The final toy items featured today are Luke’s blaster , presumably in ESB packaging, and the hapless mini-rigs apparently used by the ‘Empire Spy Force’. Not quite the most bone-chilling secret police name I’ve ever heard. And at $2 more than a three-pack, what are you going to buy? Ahhh… yeah.